"A full-color Judge's screen with important game tables! A short tour-guide to the stomping ground of the world's mightiest heroes! All this and a map of Mighty Marvel Manhattan, too! 'Nuff Said!" Now, all of the Avengers and their most dangerous enemies have been collected into one exhaustive, official encyclopedia. 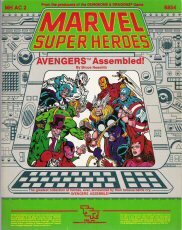 This book features complete information on 30 past and present Avengers, 22 of their fearsome enemies, the Avenger's Mansion, and S.H.I.E.L.D. ..."
"Will the real MARVEL SUPER HEROES™ please stand up? This package includes four sheets of full-color, fold-up figures and simple, illustrated instructions. Assembly required." Running a heroic conflict between the minions of a Marvel Super Villain and a group of Marvel Super Heroes is quick, easy, and exciting with these Adventure Fold-Up Figures. Using the minions and machines inside, you can bring any Marvel Super Heroes adventure to life. 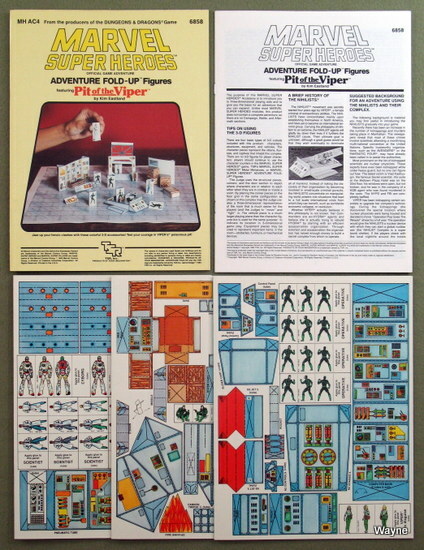 This game accessory also includes a special Marvel Super Heroes adventure, Pit of the Viper. Heroes must penetrate the Nihilists' complex to foil Viper's venomous plot!" "They are the children of the atom, the next step in human evolution. They are mutants, hated and feared by mere humans. Some, like the X-Men and the New Mutants, are protectors of humanity. Others, such as the Hellfire Club and the Brotherhood of Evil Mutants, want to be the masters of humanity. Now, the major Marvel mutants, well-meaning and malign, are collected in one book. More than 50 heroes, villains, and interested parties ... are described inside, along with notes on the X-Men's mansion, important non-mutants, and the fearsome Sentinels -- mutant-hunting robots created by the United States government to deal with the mutant menace." "There are a million stories in the teeming urban center of New York City: Gang Wars between criminal rivals. Rampages by wild-eyed mutants. Superpowered bad guys carrying grudges. It's a tough place to survive, even if you have the proportional strength of a spider. NEW YORK, NEW YORK is several products in one. Inside you'll find a handy combat wheel and random adventure generator. There's also a collection of short adventures to help you set up an urban campaign or to add spice to a published adventure. In addition, NEW YORK, NEW YORK expands the original campaign MARVEL SUPER HEROES map all the way to the river. Finally, we've included a rogues' gallery of the powerful villains and heroes that make the mighty metropolis of the Marvel Universe so challenging. 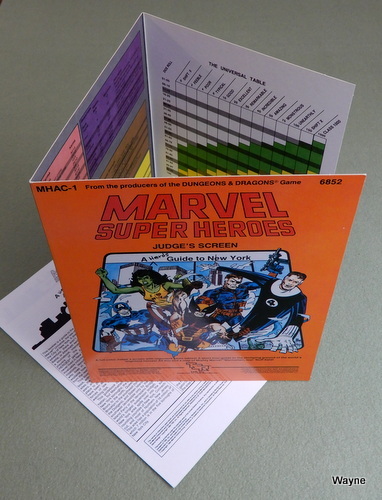 This game supplement is designed for use with the MARVEL SUPER HEROES role-playing game. It contains an easily assembled Combat Wheel, 16-page adventure book, 16-page character book, and 21.5" x 33" city expansion map." 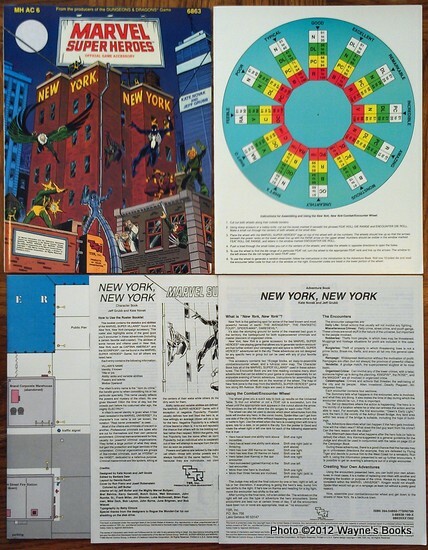 Concrete Jungle has 12 different heroes and 42 different villains, plus 12 supporting characters, and maps of the Daily Bugle, Peter Parker and Matt Murdock's apartments. "It's called the city, but it's really a concrete jungle filled with dangerous predators like SCORPION and HOBGOBLIN, masterminds like KINGPIN and HAMMERHEAD, and world-beaters like the RED SKULL and TITANIUM MAN. It is also the home of such heroes as SPIDER-MAN, DAREDEVIL, and MOON KNIGHT, plus numerous shadowy figures such as the PUNISHER and CLOAK and DAGGER. Gathered here in one place are the foes you love to hate and the heroes who patrol the urban wasteland. Miss it at your own risk! 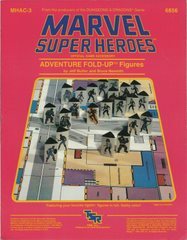 This game supplement is designed for use with the MARVEL SUPER HEROES role-playing game. This package contains a 32-page book describing the villains that threaten the city, and the heroes that protect it." "In a world that is filled with super-powered heroes, super-dangerous mutants, and super-deadly villains, what's an everyday criminal or multi-millionaire to do? Get a Weapon. And fast. Battlesuits, from S.H.I.E.L.D. body armor to the latest fashions for IRON MAN; the powered weapon suits of the United States and Soviet Governments; weapons, from cheap handguns to atomic-tipped missiles; special weapons, including the mighty shield of CAPTAIN AMERICA and the awesome arsenal of arrows of HAWKEYE the archer. This accessory describes the various vicious devices used by villains and heroes, so you can send in the MANDROIDS at a drop of a helmet. 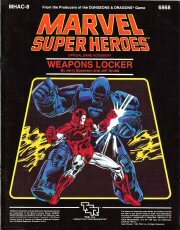 WEAPONS LOCKER is a game accessory for use with the MARVEL SUPER HEROES role-playing game, and contains a 32-page sourcebook of battlesuits and individual weapons used in the MARVEL UNIVERSE." "The frontiers of the Marvel Universe are vast and some can be crossed only by those who have mastered the arcane arts of sorcery. Those who follow the mystic way, like Earth's Sorcerer Supreme, Doctor Strange, are among the greatest of heroes. In the worlds beyond ours lurk their awesome foes -- the dread Dormmammu, the malefic Nightmare, the treacherous Baron Mordo. Within this work the mysteries of Marvel magic are revealed. New rules and explanations on using magic, new spells, and details on creating magical characters are included. More than twenty mystic dimensions are described. Full details are provided on the most important magic items, including Doctor Strange's amulet, Shaman's pouch, and Magik's mystical sword. Sixteen of Marvel's mightiest sorcerers are presented in full detail. This is a treasure-trove of wonders from the pages of Marvel Comics. This game accessory is designed for use with the Marvel Super Heroes Role-Playing Game. This package includes a 40-page rulebook on magic, a 40-page sourcebook with further explanations and detail, and a 16-page roster book on Marvel magicians." "The Gamer's Handbook of the MARVEL UNIVERSE™ is the complete, last word on the heroes, villains, and other characters of the Marve! 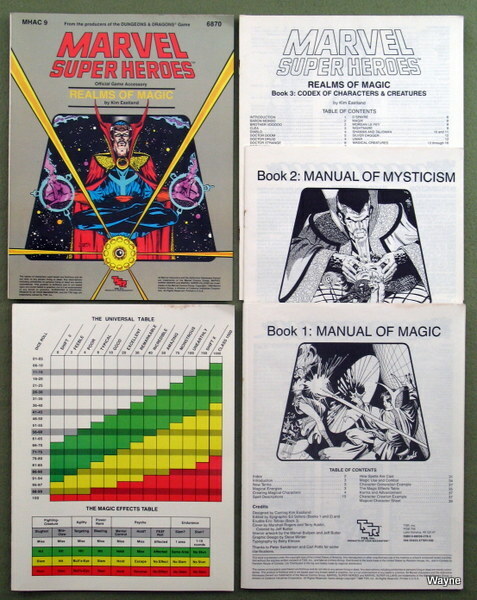 Universe that the players of the MARVEL SUPER HEROES™ role-playing game have been looking for! Supplemented by data from the popular OFFICIAL HANDBOOK OF THE MARVEL UNIVERSE™, the Gamer's Handbook of the MARVEL UNIVERSE™ has complete MARVEL SUPER HEROES™ game statistics for hundreds of Marvel characters—the good, the bad, and the in-between! 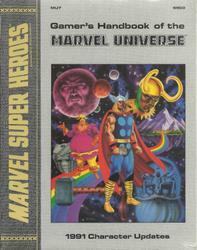 The pages of the Gamer's Handbook of the MARVEL UNIVERSE™ are designed to be removed from the book for easy play. The pages are five-hole punched so they can be organized in a binder. And each page includes complete background information, important facts, and complete stats—everything you need! 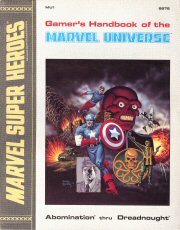 This first volume of the Gamer's Handbook of the MARVEL UNIVERSE™ covers the characters ABOMINATION™ through DREADNOUGHT™. Look for more volumes in the near future covering more of your favorite Marvel characters!" "The Gamer's Handbook of the MARVEL UNIVERSE™ is the complete, last word on the heroes, villains, and other characters of the Marvel Universe that players of the MARVEL SUPER-HEROES™ role-playing game have been looking for! Supplemented by data from the popular OFFICIAL HANDBOOK OF THE MARVEL UNIVERSE™, the Gamer's Handbook of the MARVEL UNIVERSE* has complete MARVEL SUPER HEROESm game statistics for hundreds of Marvel characters—the good, the bad, and the in-between! 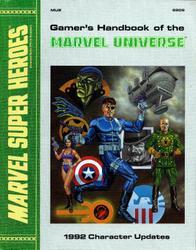 The pages of the Gamer's Handbook of the MARVEL UNIVERSE"* are designed to be removed from the book for easy play. The pages are five-hole punched so they can be organized in a binder. And each page includes complete background information, important facts, and complete stats—everything you need! And the Gamer's Handbook of the MARVEL UNIVERSE" contains over 100 first-rate portraits of your favorite heroes and villains—including many pieces commissioned especially for this book and never seen before! 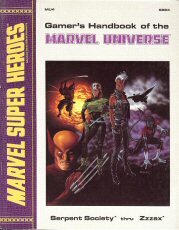 This fifth volume of the Gamer's Handbook of the MARVEL UNIVERSE™ covers updates on familiar characters who have changed (such as the THING™ and MADELYNE PRYOR™) and new characters who appeared in 1989 (such as CHAMELEON™ and TOMBSTONE™). Look for the first four volumes in your local stores, and watch for further updates in the years ahead!" "The Gamer's Handbook of the MARVEL UNIVERSE™ is the latest word on the heroes, villains, and other characters of the Marvel Universe that players of the MARVEL SUPER HEROES™ role-playing game have been looking for! 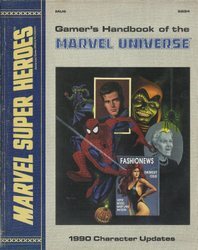 Supplemented by data from the popular Official Handbook of the MARVEL UNIVERSE™ and current Marvel comic books, the 1991 Gamer's Handbook of the MARVEL UNIVERSE™ has complete game statistics for hundreds of Marvel characters—including CABLE™, CALYPSO™, the MUTANT LIBERATION FRONT™, and the SPIDER-SLAYERS™! 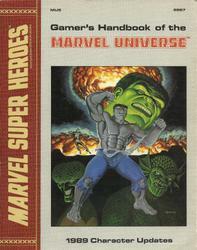 The pages of the Gamer's Handbook of the MARVEL UNIVERSE™ are designed to be removed from the book for easy play. The pages are five-hole punched so they can be organized in a binder. Each page includes complete background information, important facts, and complete stats—everything you need! The Gamer's Handbook of the MARVEL UNIVERSE covers updates on familiar characters who have changed and new characters who appeared in 1991. Look for the first four volumes and the 1989 and 1990 Updates in your local stores, and watch for further updates in the years ahead!" "It's here! 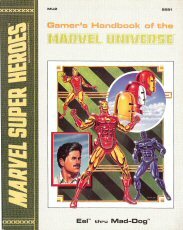 The Gamer's Handbook of the MARVEL UNIVERSE™ for 1992 is jam-packed with the latest heroes and villains of the MARVEL UNIVERSE, as well as updates on some old favorites, for players of the MARVEL SUPER HEROES™ role-playing game! 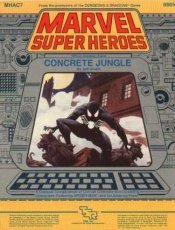 These full color pages contain information from the many exciting Marvel comic books as well as data from the Official Handbook of the MARVEL UNIVERSE Deluxe and Master Editions. 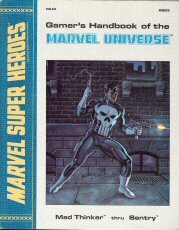 The 1992 Gamer's Handbook of the MARVEL UNIVERSE has complete game statistics for hundreds of Marvel characters—including BISHOP™, BLACKOUT™, DARKHAWK™, DOMINO™, INFINITY WATCH™, MIDNIGHT SUN™, the PANTHEON™, and the SHADOW KING™! The pages of the Gamer's Handbook of the MARVEL UNIVERSE are designed to be removed from the book for easy use and organization, The pages are five-hole punched so they can be arranged in a binder. Each page includes complete background information, important facts, and complete game stats—everything you need to make the character come alive in your role-playing game and in your imagination! The Gamer's Handbook of the MARVEL UNIVERSE covers updates on major changes to older characters and the power groups of the MARVEL UNIVERSE as well as presenting information on the rookies who appeared in 1992. 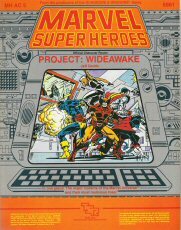 Look for the first four Gamer's Handbooks and their 1989, 1990, and 1991 Updates in your local game and hobby stores, and be ready for further exciting MARVEL UNIVERSE updates in the years ahead!" Wizards of the Coast owns (and holds trademark to) the MSH RPG in all forms.